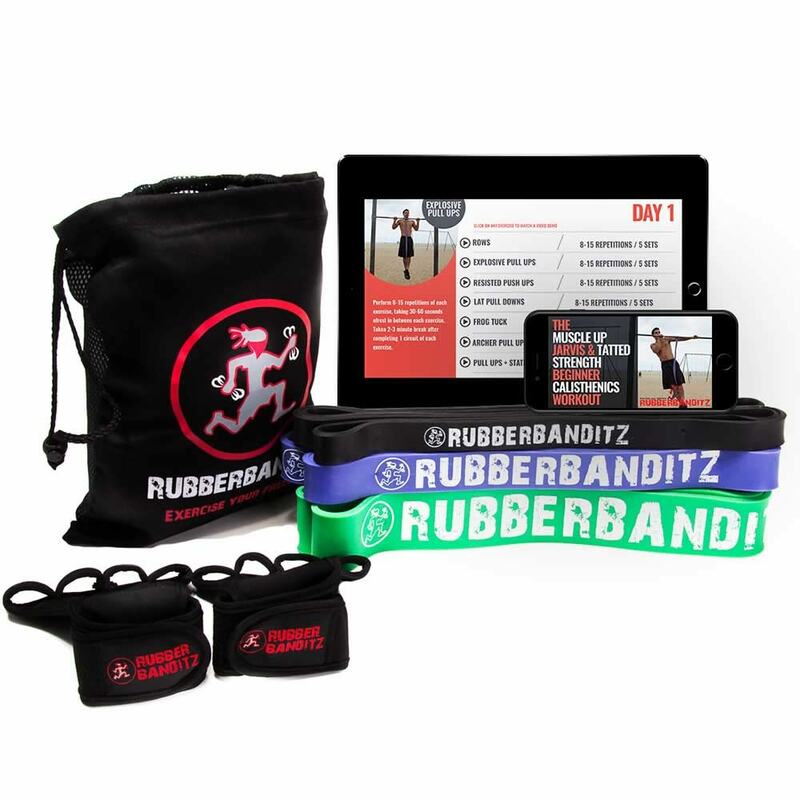 These comprehensive assisted bodyweight training band sets complete with every size band. 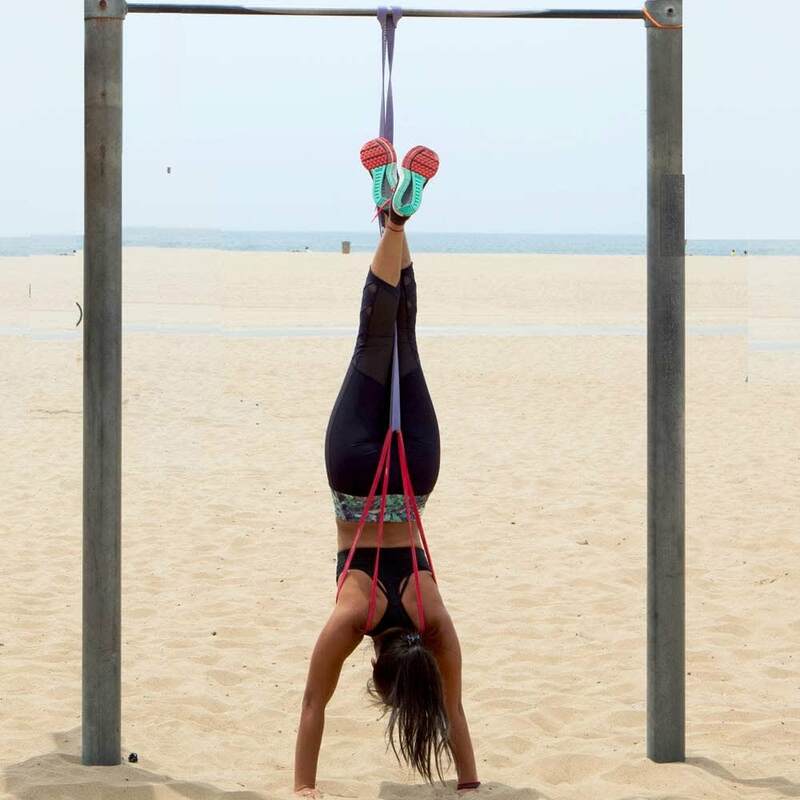 Scale up or down with a full range of assisted bodyweight training resistance levels. The light and medium bands are tremendous assets for warm-ups, stretching, and high rep exercises. The thicker bands can be used broadly for assisted body weight training (i.e. 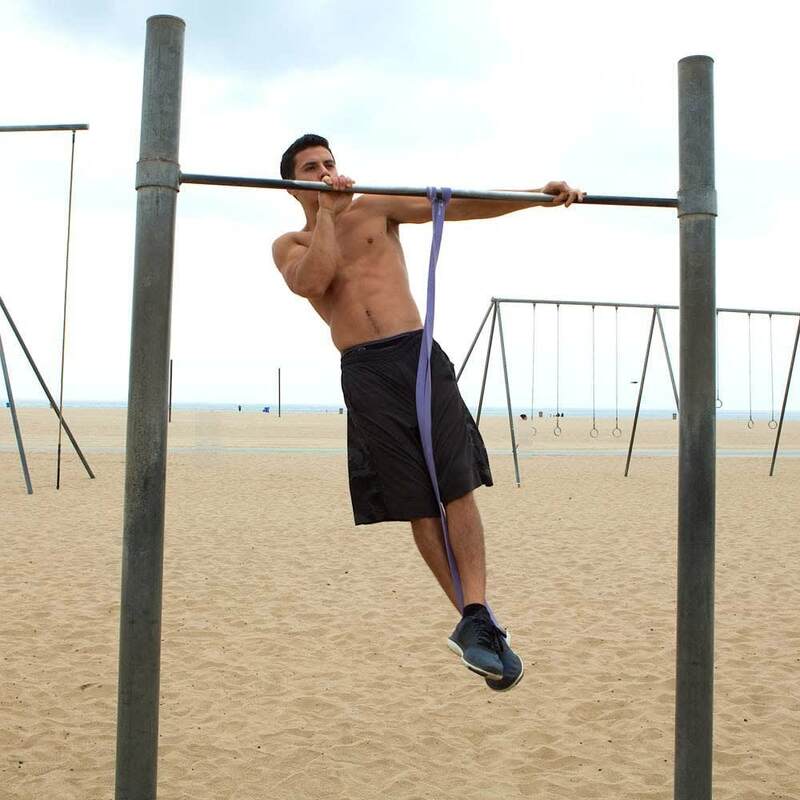 assisted pull-ups) and for resistance training, where you are pushing or pulling against the band to create load (i.e. squats).Used by athletes from beginner to seasoned pro. 1) You can optimize the amount of resistance needed. Example: Try your first set with the #3 HEAVY BAND, then one set with the #4 ROBUST BAND, then one set with the ROBUST + HEAVY BAND as you fatigue. 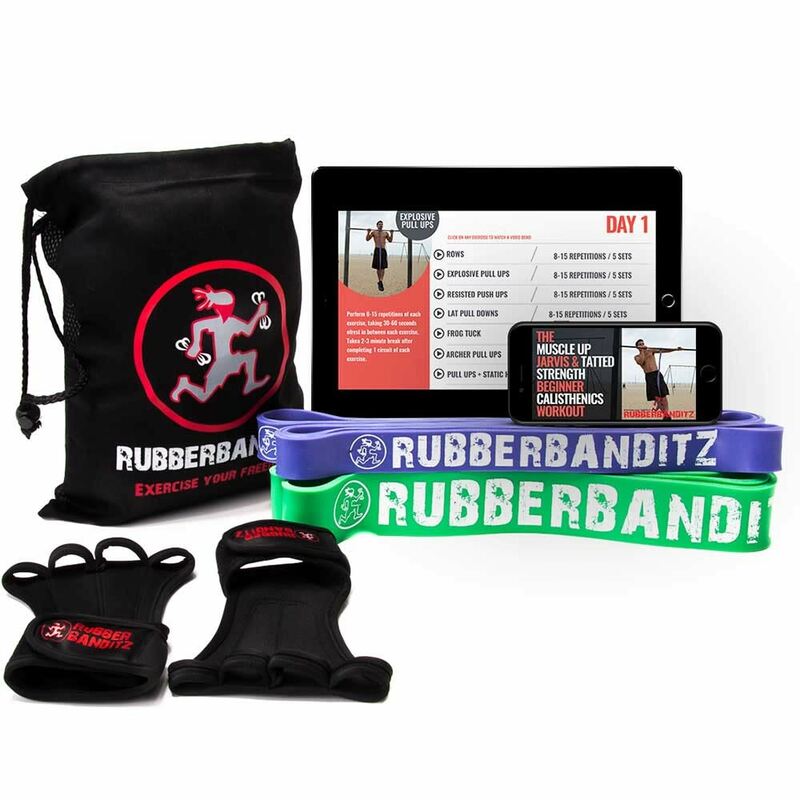 2) The set creates a fitness a toolbox and enables you to do more exercises. Example: the HEAVY and ROBUST BANDS are great when combined, but the LIGHT BAND alone is perfect for arm circles to warm up your shoulders before getting on the bar. 3) As you get stronger you can graduate to a different band. 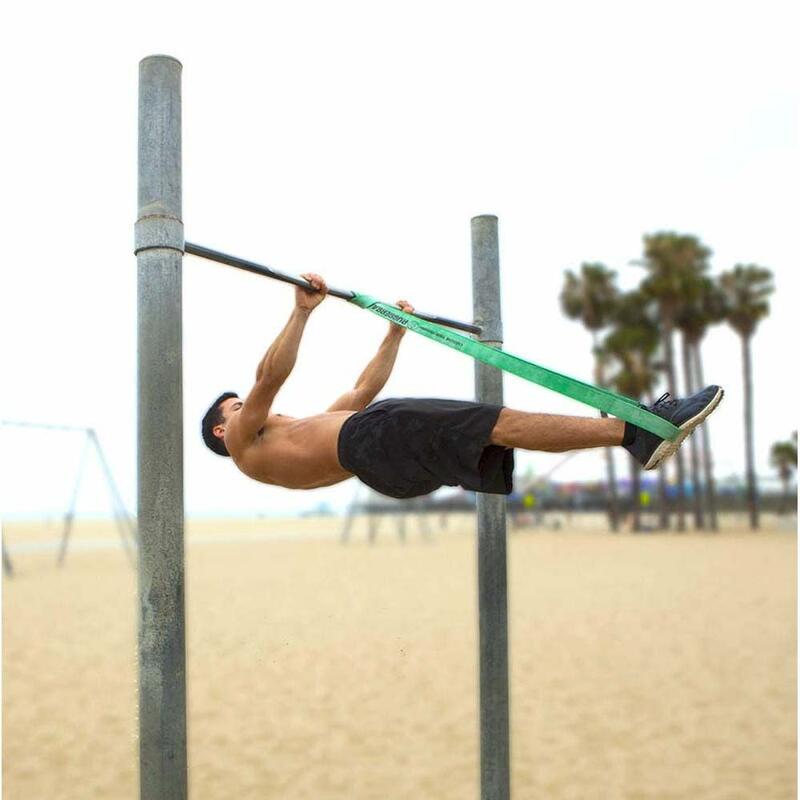 Example: Let's assume you are able to hold your front lever with the ROBUST BAND. Now it's time to train with just the HEAVY BAND. *Each band is 41" [104 cm] in length and is made 99% free of soluble proteins (latex allergens) and can stretch up to 3x its resting length. Gloves are currently oversold. They'll be back in stock shortly and you'll be able to choose the various sizes. is the bag in the picture included in the product? 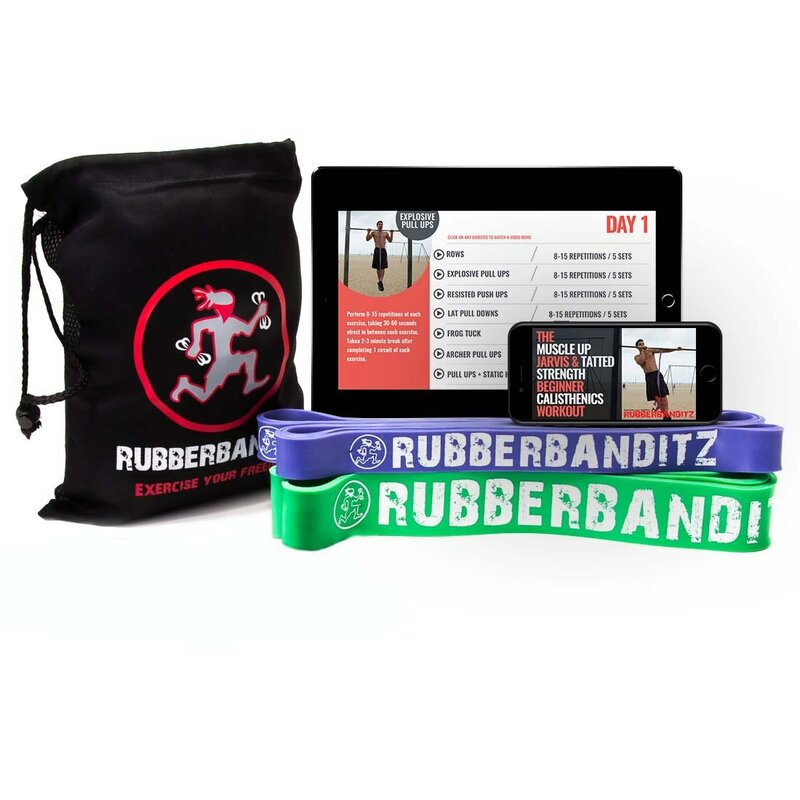 Yup - the kits include the bands and a travel bag. Gloves are optional. hOW DO YOU DETERmine which glove size is right for you? We just added a size chart for the gloves to the product description. Let us know if you have any other questions! Are your bands made from sustainable rubber? While we strive our best to be a socially responsible company, we are currently unable to guarantee sustainability in our supply chain. It's one of our goals to improve this and in our long term plans. Love this Calisthenics Kit! I recently moved and haven’t found a gym that I loved. My friends have been raving about the workouts they get using their bands and so I figured I’d give it a try. 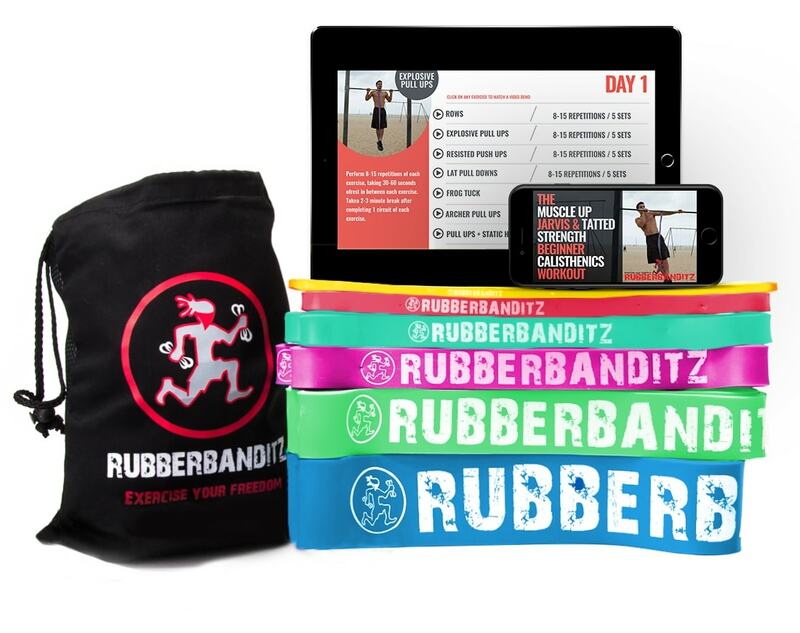 I can’t say enough great things about these resistance bands. The bands give such versatility to my workouts and the best part is – I don’t have to go to the gym. Amazing product!! I’m looking to tone and increase my overall strength. My trainer suggested resistance bands for home (and on-the-go workouts). Did some research and found this band-combo kit. Shipping time was impressive; packaging was exactly as I expected; and a bonus feature is the bodyweight training app that comes with it. I’ve already seen a huge improvement on my assisted pull-ups. Love these bands! Thanks, Rubberbanditz! I’ve contemplated getting resistance bands for some time now and finally just pulled the trigger and purchased the Calisthenics Kit. These bands are solid. 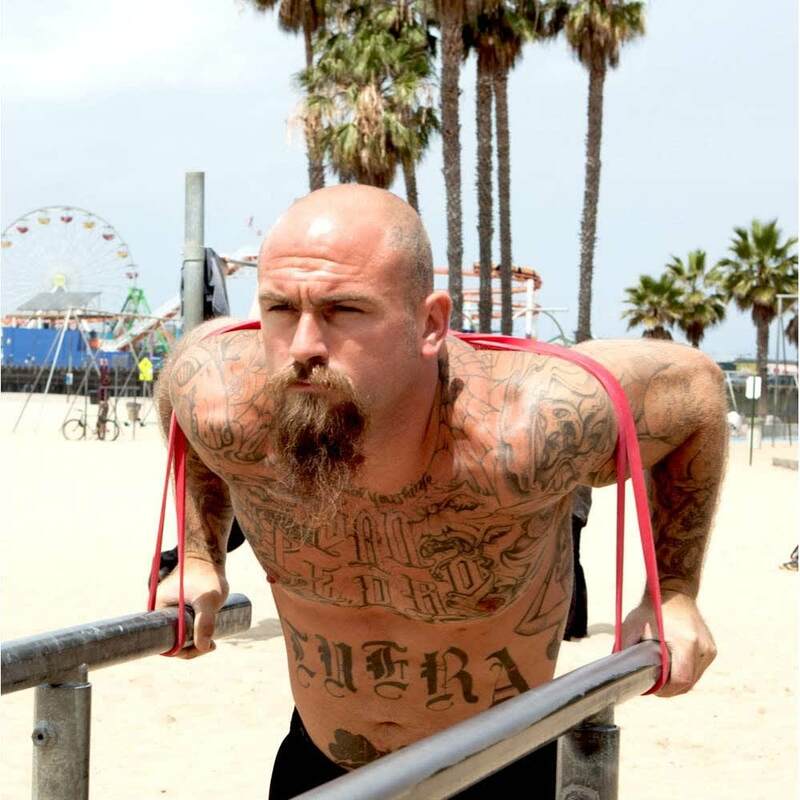 I’ve been an athlete all my life; however, I’m new to Calisthenics and these bands are exactly what I needed. 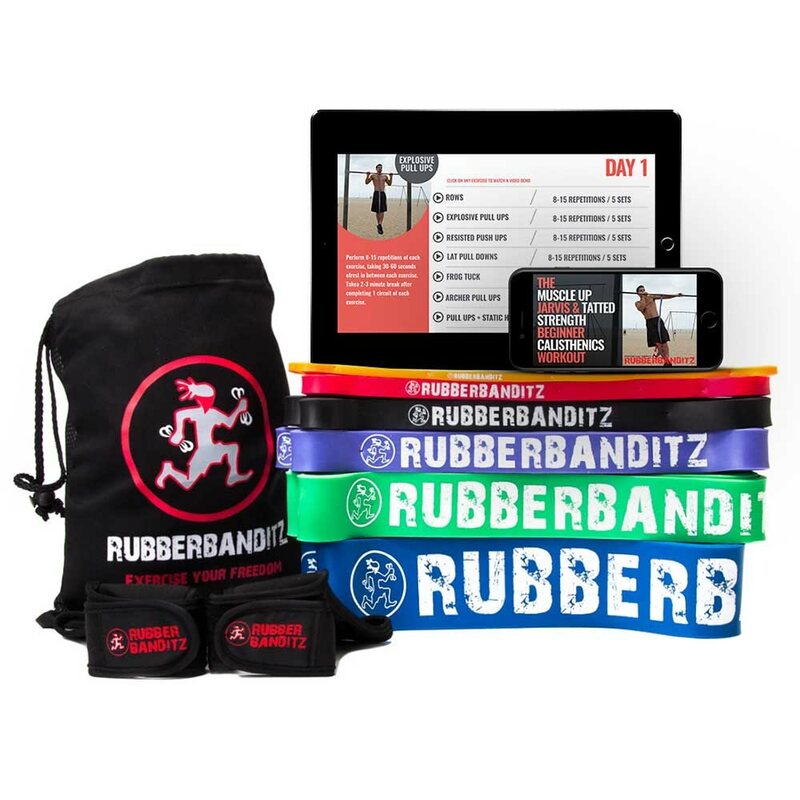 Love the training app that comes with it; also love all the info that their website offers the customer – whether they are beginners or not. Great product! 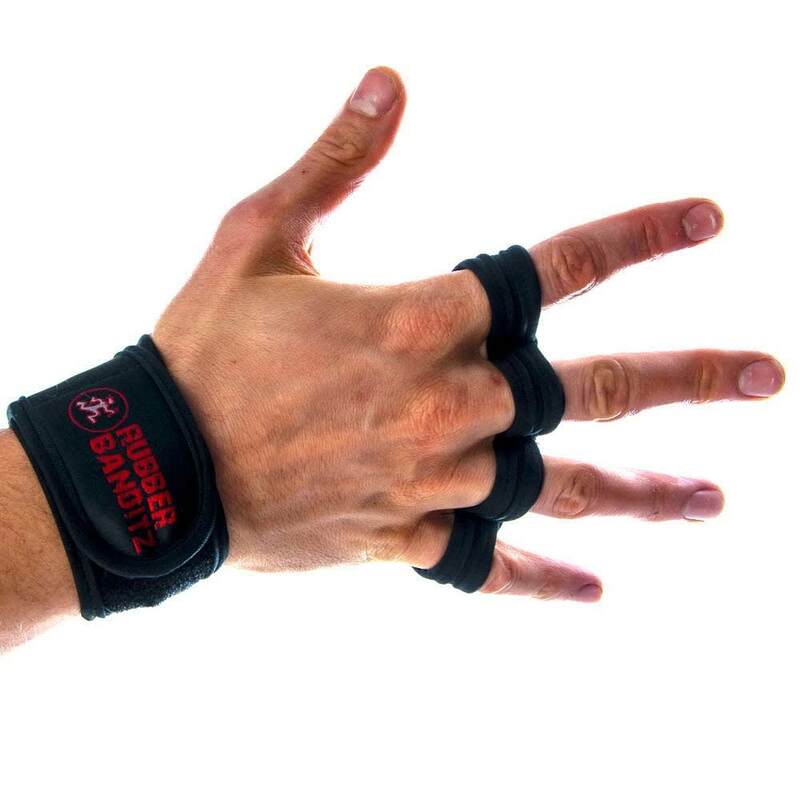 Came across the Bar Master Calisthenics Kit and purchased them for a few of my clients. As a personal trainer, I don’t believe in gyms or bulky machines. I’ve been training for years and some of my best work-outs have been with my resistance bands! 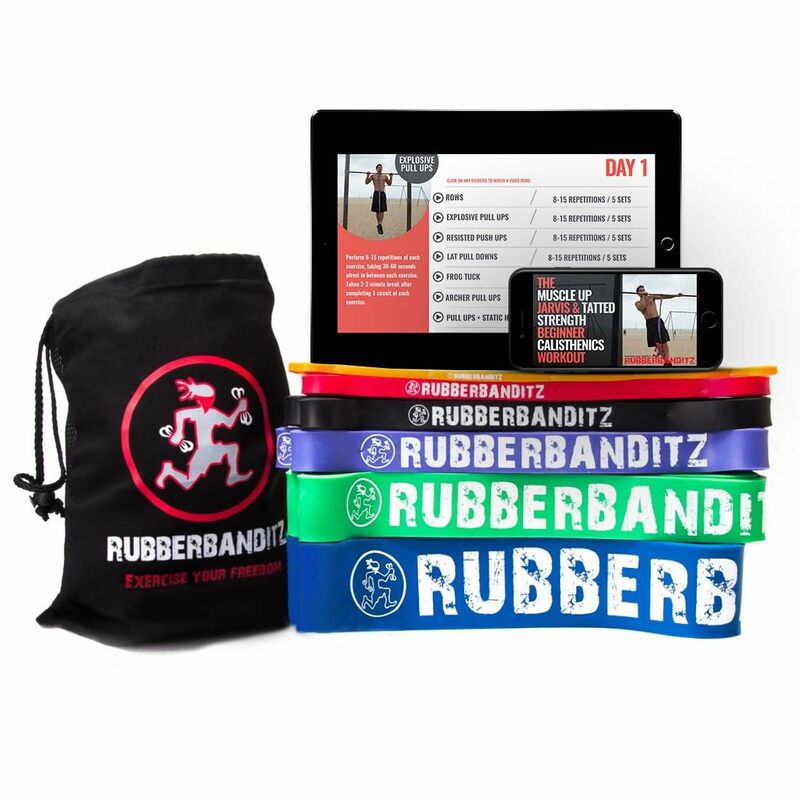 Rubberbanditz has exceptional products at great price points. I’ll be using this Calisthenics Kit with my clients and for myself!